Apple, spice and everything nice. That is what fall baking is all about. I made this cake for a very dear friend of mine; Annie who loves spice cakes, and she has a lot of spice herself. 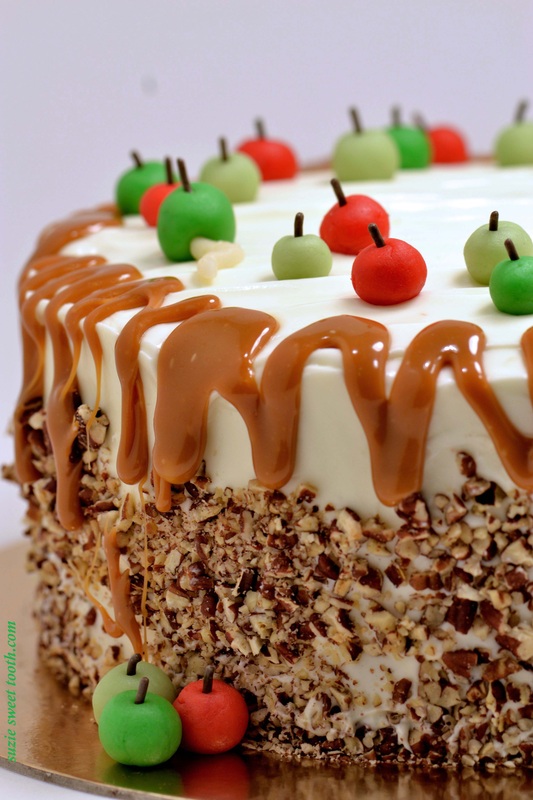 A three layer moist cake with grated apples in the batter, notes of caramel and lots of spice. 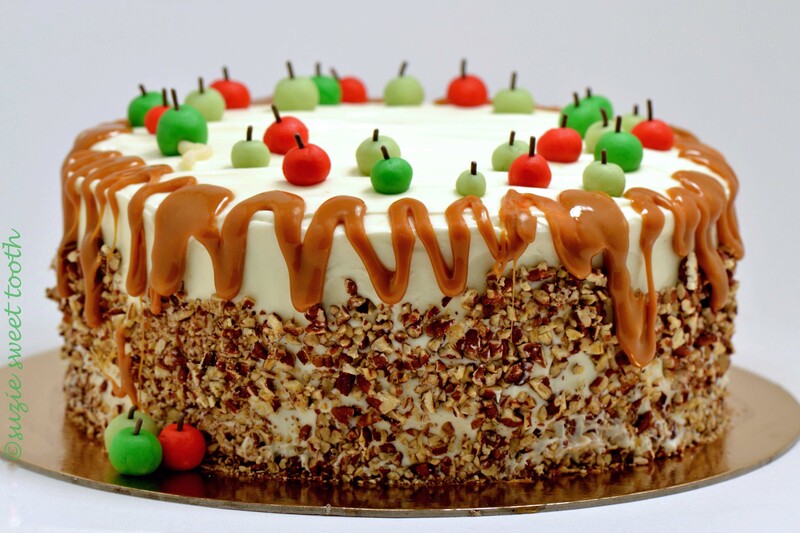 Fill and slather this wonderful cake with a dose of rich indulgent cream cheese frosting, top with a generous caramel drizzle and you will make friends fast. The apples are made by tinting marzipan into various apple colors, shaping into small rounds and gently pierced with a chocolate jimmy. Happy Birthday Annie! Notice the dark green apple top left with the worm sticking out of it? that was Seth’s idea. He is so creative. Hmmm, I wonder where he gets that from…..
1. Preheat the oven to 350 degrees F. Prepare 3 nine inch pans by spraying with nonstick baking spray and lining the bottom with parchment paper. 2. Cream the butter and sugars on medium high-speed until light and fluffy. Add in the molasses and syrup. Add in the eggs one at a time and beat until combined. Add in the vanilla. In a medium bowl, combine all the dry ingredients and whisk to combine. Add one-third of the dry ingredients and alternate with the sour cream in 2 increments. Scrape down the sides of the bowl after each addition and end with flour addition. Stir in the apples until fully combined. 3. Divide the batter between 3 prepared pans and bake at 350 degrees for about 30-35 minutes. Let cool on a wire rack about 15 minutes and then remove from the pans and allow to cool completely. Fill and frost with cream cheese frosting. Drizzle with purchased caramel topping. * Suzie variation: Sometimes I like to add the white chocolate. It gives the frosting a little more body and adds a really rich flavor.